Learn all about our native Facebook Pixel Integration for OCU and how to view the value for the Purchase Events! There are 2 ways to integrate your Facebook Pixel ID with the OCU app using our built-in integration. We also have integrations available for Trackify and Pixel Perfect apps that can be enabled in the Settings > Integrations section of OCU. If you will be using either of those integrations instead, don't add your FB Pixel ID to the OCU app's settings as it will cause issues. 1. 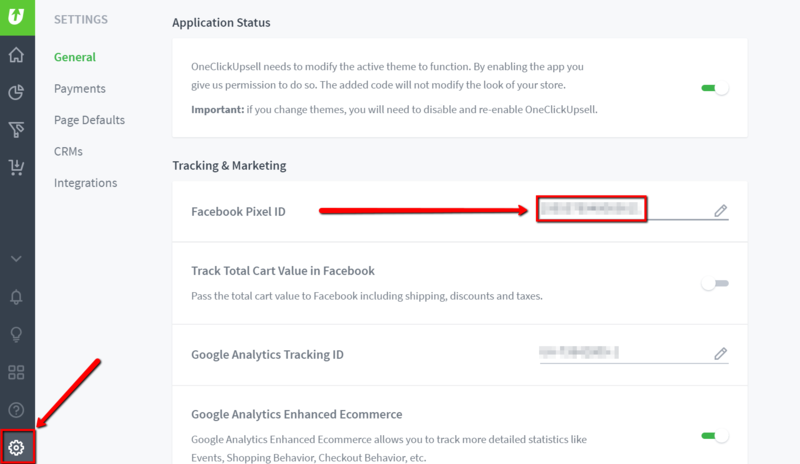 If you're only using the Shopify native Facebook Pixel integration found under the Online Store > Preferences > Facebook Pixel section of your Shopify admin, then that is all that will be required to configure OCU for Facebook. If you have a Facebook pixel ID added to BOTH the Shopify native integration as well as the OCU app, then the one inserted into the OCU app will take priority and be used for the OCU checkout on your store. *Note: In the unlikely case that you are using 2 different Facebook Pixel account ID's, the one that is inserted into the OCU app will take priority. With the OCU FB Pixel integration, it's possible to track the Total Cart Value by enabling the "Track Total Cart Value in Facebook" switcher. When enabled, the integration will pass the total cart value to Facebook including shipping, discounts and taxes. *Note: The native Facebook Pixel ID integration for Shopify only sends the Subtotal amount. If you want the Total amount sent, then your Facebook Pixel ID needs to be added to the OCU app and the "Track Total Cart Value in Facebook" setting enabled. Click the "Menu" button in the top left corner and then select "Pixels". On the right side of the screen underneath your Pixel name, you can view your Pixel ID. This is the number that you need to copy and paste into the OCU app. 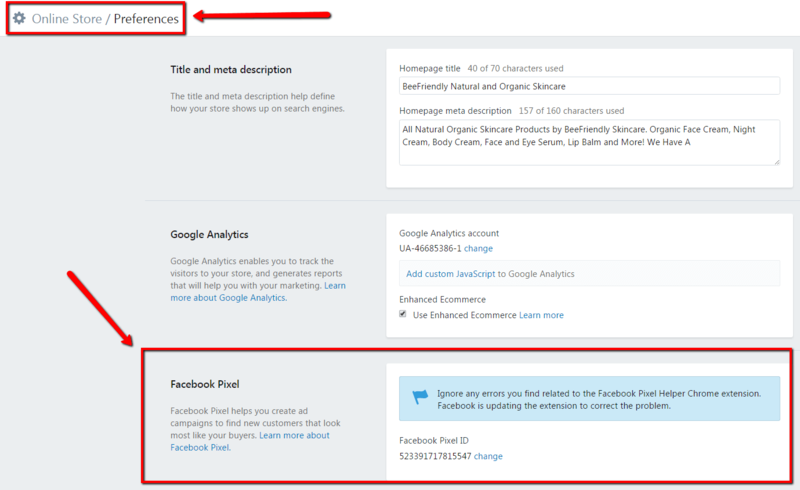 *Note: If you've never created your Facebook pixel or haven't used it yet, then please see the help documentation at the end of this guide for information on how to create and view your Facebook pixel. *Note: You won't see the Event listed here until the action has been completed either by you through test purchases or through your customer's purchases. So they won't be listed here until the "Event" has actually been triggered on your store. If you want ALL of these events to show, you can place tester orders where you have an upsell funnel assigned with 3 upsells and 2 downsells configured to show. Place one test order and accept upsells 1, 2 and 3. Place another test order and decline the 1st upsell, but accept the 1st downsell. Place a final test order and accept the 1st upsell, decline the 2nd upsell and accept the 2nd downsell. 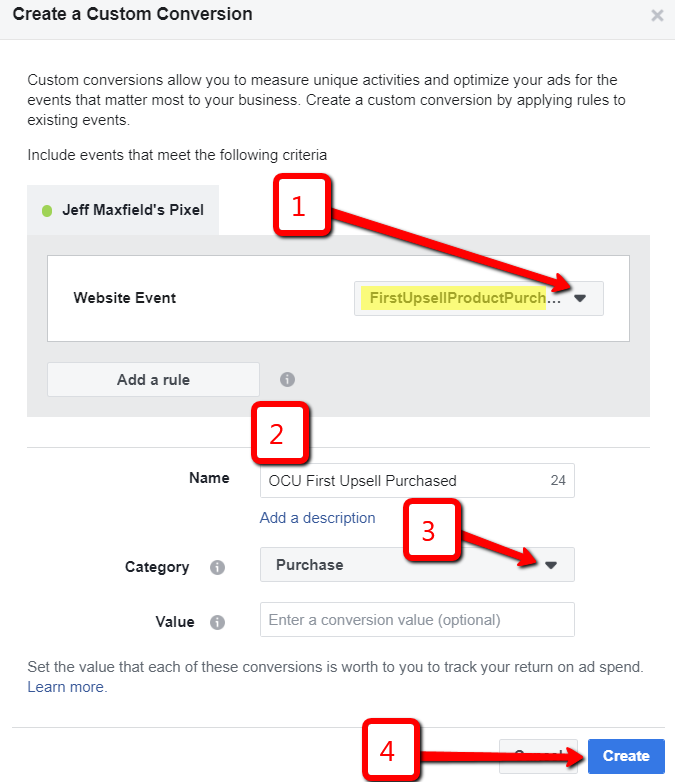 Once you've gotten these "Events" to fire in your Facebook Ads Manager account, the second step that you need to do is to click on the "Menu" in the upper-left corner and select "Custom Conversions" found under the Measure & Report section. Within Custom Conversions you then need to create a customer conversion for each post-purchase OCU event that you want to view the data for in your Reporting Dashboard. 1. Click the "Create Custom Conversion" button. 2. Under "Website Event" you select the event, in this case "FirstUpsellProductPurchased". 3. Name the Custom Conversion I.e. "OCU First Upsell Purchased". 4. Choose the "Category" as "Purchase" and leave the "Value" field empty (the value will be calculated correctly by OCU's integration) and then click the "Create" button to create the custom conversion. Then you need to repeat this Customer Conversion creation process for each of the post-purchase OCU events listed that you want to be able to view in your Ads Reporting Dashboard. *Note: The events will not actually show up under "Website Event" unless they've already happened at least once on your store. You need to either place test orders as described earlier or have live customer sales that trigger those events beforehand so they will show up for selection when creating your Custom Conversions. 1. Click on the "Menu" button in the upper-left corner and select "Ads Manager". 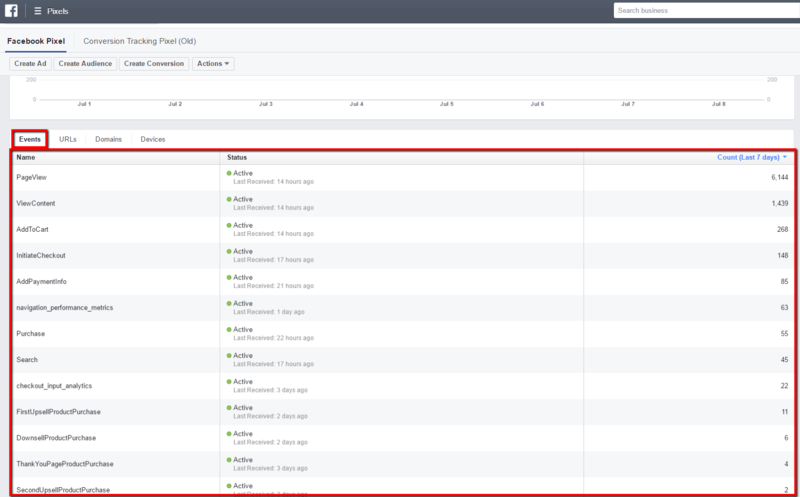 Here you can view a reports dashboard for the Facebook ad campaigns that you're running. In this example, the "Performance and Clicks" view has been selected. 2. To view the data for the initial purchases, click the "Columns" drop-down menu and select "Customize Columns". 3. Select the "Websites" category on the left. Then select the "Purchase (Facebook Pixel)" the "Cost per Purchase (Facebook Pixel)" and the "Purchase Conversion Value (Facebook Pixel)"
4. Rearrange the 3 data points selected on the right-hand side to show the "Purchase" then the "Cost" and then the "Value" and then click "Apply". 6. To view the data on how many post-purchase upsell/downsell purchases happened from this campaign, click the "Columns" drop-down and select "Customize Columns" again. Upsell 1 Purchase Conversion Value, Upsell 2 Purchase Conversion Value, Upsell 3 Purchase Conversion Value, Downsell 1 Purchase Conversion Value and Downsell 2 Purchase Conversion Value. Then click the "Apply" button. *Note: We're not going to select the cost for these post-purchases because all that is relevant here is the cost for the initial checkout purchase. We care about how much it cost to create a customer's initial order, not how much it costs for each individual upsell or post-purchase offer. So no need to select those costs here as they're irrelevant. You can see each individual upsell and downsell offer that's happening in this funnel and the extra money made from each of those custom conversions. You can also see how many initial purchases happened as well as the cost and the total purchase value. *Note: Keep in mind that Facebook's attribution under the Conversion Value column is about 20-30% light in our experience so you can always round these numbers up a little bit. This is now how you can track in an Ad Campaign, Ad Set and an Ad, how many post-purchase offers are being taken and the value each of those as well. It's a phenomenal feature for OneClickUpsell because it allows you to not only see all of the purchases that happen and the value of those events, but also the additional monies made from the post-purchase offers after someone has made their initial purchase. If you wanted to see the Total monies made from this campaign (initial purchases + post-purchase offers taken) then you would sum up the revenue accrued from the initial purchases and all of the post-purchase offers taken as well. Your pixel is ready! Now you can copy the Pixel's code or email it.